Seafood lovers know what they want—a wide selection of the freshest, tastiest, seafood possible. Whether you’re a local or visiting Victoria, British Columbia, Canada for the first time, you’re going to want to try BC seafood. Finn’s seafood restaurant is home to a large selection of local and sustainably caught seafood for the freshest fare. 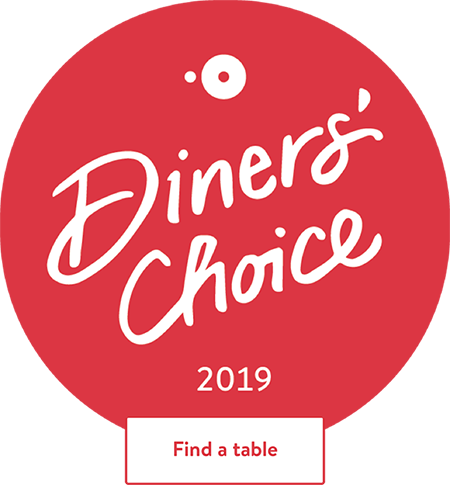 From made-from-scratch fish and chips to the wild BC salmon fillet elegantly prepared with lobster oil and a cider and leek cream sauce, the seafood dishes range from the traditional to the more contemporary to suit every taste. If shellfish is what you’re after, try the steamed Atlantic lobster or steamed local Dungeness crab. For the classic seafood enthusiast, Atlantic lobster and local crab are taken straight from live tanks and cooked to perfection on the spot. Served with drawn butter, charred lemon, seasonal vegetables, and steamed baby potatoes sliced into medallions tossed with butter and fresh herbs, this is an always fresh and unforgettable meal. This dish will invoke memories of childhood summers spent crabbing off the docks or of rowdy East Coast celebrations centred around steaming lobster and melted garlic butter. Fresh steamed mussels are another West Coast favourite. 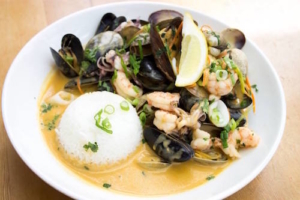 Larger than clams and with a delicate meaty texture, mussels lend themselves to many different flavours, with your choice of three delicious sauces: Thai Red Coconut Curry; Cilantro, Leek and Carrots or the classic White Wine and Garlic. Crab cakes are a menu staple among seafood lovers everywhere. These crab cakes are packed with real crab meat, pan-seared to a golden brown and served with a delectable avocado lime sour cream and nestled in a bed of fresh greens. Perfect as a starter or small meal on their own, our guests rave about this satisfying dish. Order the panko fried oysters and be prepared to share with the rest of the table. Addictively good, these are made with only the freshest locally sourced Premium oysters. These gems are coated in a light, crispy batter, and served with lemon and house-made tartar sauce. Enjoy them with a crisp salad (try the Artisan Greens Fennel and Orange salad) to complete your meal. Available as an appetizer or served as a full meal with your choice of field greens or hand-cut fries, the Wild Prawn Tacos are always a hit. 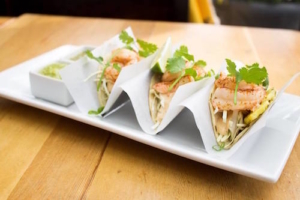 Loaded with plump wild prawns, sweet grilled pineapple, salsa verde, shredded cabbage for extra crunch, and a side of spicy chipotle aioli, they’re a crowd favourite for sharing or for keeping all to yourself. Last but definitely not least are oysters on a half shell. Available any time of day, you can choose from a half dozen local Premium or Superior iced oysters on the half shell, served simply with cocktail sauce, fresh horseradish, and lemon. This is only the tip of the iceberg. See Finn’s full menu. Want even more seafood? At Finn’s, you can treat yourself and add your choice of lobster tail, ½ pound of Alaskan King Crab legs, or wild prawns to your meal. I wanted to have a decent meal in Victoria and I got an excellent one. The best seafood chowder I have ever had, followed by two lobster tails on a bed of mash with vegetables. This meal was rounded off with an orange and vanilla bean curd with fresh raspberries. Never has a meal on this trip made me so happy. – Aussie135, London, UK. If you’re into seafood, be sure to check out Finn’s Seafood, Chops & Cocktails restaurant (https://www.finnsvictoria.com) at 1208 Wharf Street overlooking the harbour in beautiful Victoria, BC next time you’re visiting Vancouver Island.